Dr. Sabedra is a Northwest Indiana native who attended Indiana University for her undergraduate studies. She put away her Hoosier pride in 2011 when she was accepted to Purdue University's College of Veterinary Medicine. After graduating in 2015 she started working as an associate at Hobart Animal Clinic. 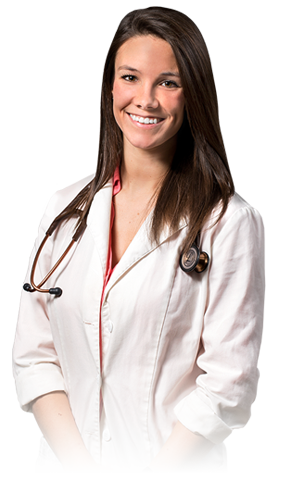 Her interests include internal medicine, ultrasound, soft tissue surgery, and emergency medicine. She currently lives in Chesterton with her 2 pitbull terriers (Penny Lane & Lucie) and her fiance Lucas. Outside of the clinic, Dr. Sabedra enjoys long distance running, hiking the dunes with her dogs, and cooking. Dr. Sabedra and Lucas will be married in July 2016 and they are looking forward to the exciting adventures ahead.